Chowdah, as it is pronounced around these parts, also known as chowder. I had some chicken thighs in the freezer and I needed to put something together quick and one pan. 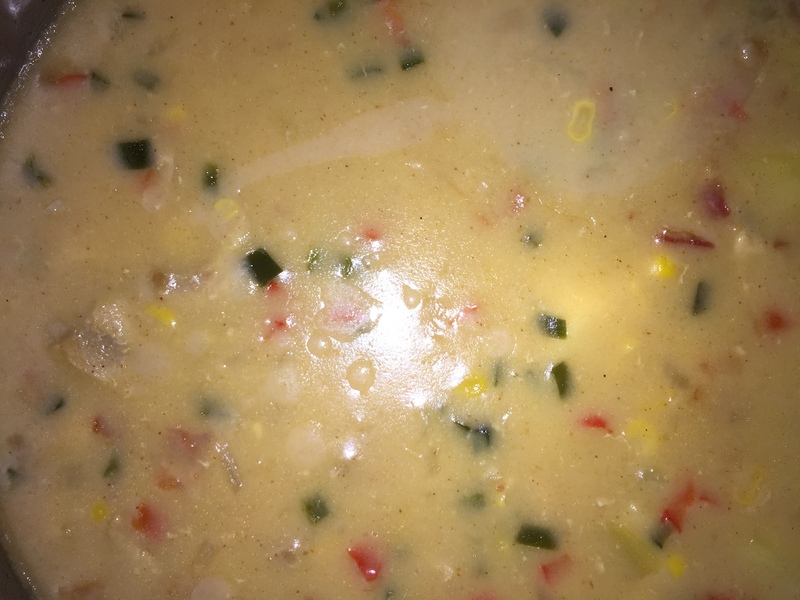 So this was my rendition of a chicken corn chowder. Fistful of cooked and crumbled bacon bits. Poach the chopped chicken in water to cover completely with some salt a couple of Bay leaves for about 30 minutes till the chicken is completely done. While poaching the chicken skim of the foamy bits that float to clarify the broth that forms. Strain out the chicken completely and reserve the resulting chicken stock separately. Sauté onions in a Tbsp of butter and some vegetable oil until translucnet and they start taking on a little bit of colour. Add both the peppers and continue sautéing till the peppers are soft and start to take on some colour. Add the flour and continue mixing to cook out the flour flavour and make an in situ roux. When the roux has taken on a golden colour add the reserved chicken stock and bring to a simmer. At this point the liquid should be quite thick. Add in the cumin, cayenne and one more bay leaf. Season with salt. Thin it out with the milk and heat to boil and simmer for about 5 minutes to meld the flavours. Add in the chicken and potatoes and continue till everything is heated up. The soup should have the consistency of a thin pancake batter. Chicken and Rice, World citizens….